An exciting, fast-paced, well-spun yarn of a patriot betrayed by his wife, his friends, his senses and, ultimately, even himself, 4o4 explores our nation’s vulnerability to cyber-attack and how the United States is coping with the 21st century struggle to balance the right to privacy with our cyber vulnerability. Planes crash into one another midair. Nuclear power plants go berserk. Railroad crossing gates rise, letting cars pass just as trains whistle by. Thousands are injured or killed. The only connection between these seemingly unrelated events is that the systems controlling them are all Internet-based. FBI cryptanalyst forensic examiner John Decker, working at the National Counter Terrorism Center in Northern Virginia, uncovers a deadly plot to sabotage a key U.S. defense contractor. When the plot leads to an old Islamist adversary, long thought dead, Special Agent Decker has no idea he is about to be thrust into a diabolical conspiracy that winds to the heart of our national defense. In the course of a week, America is paralyzed by a series of devastating cyber-attacks that cripple the nation’s security, financial markets and transportation systems. Assisted by beautiful and brilliant computer expert Xin Liu (Lulu), Decker must unravel the mystery behind whoever—or whatever—is taking over the Net. 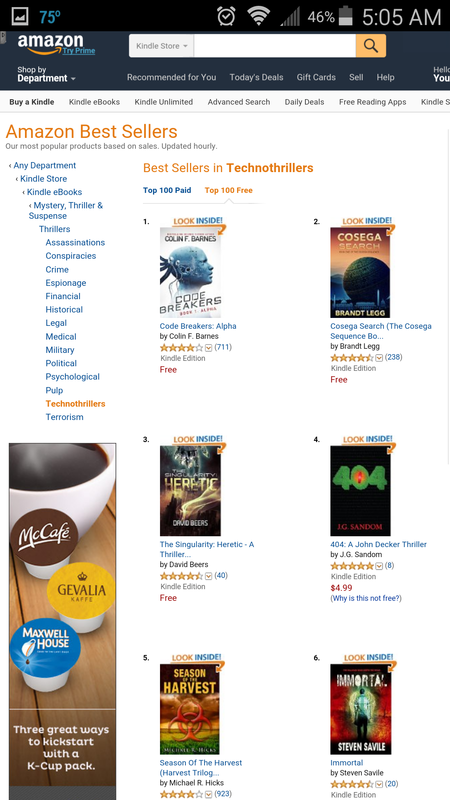 4o4 made it to #4 on the Amazon Thriller bestseller list. Who’s responsible for these deadly cyber-attacks? Is it Jihadists of the Crimson Scimitar cell led by Decker’s old nemesis, El Aqrab? Is it North Koreans working out of Dandong, China? Or, is it somebody else altogether instead? To purchase your copy of 4o4 @ Amazon, click here. This entry was posted in Books and tagged 404, Best-Selling, Cornucopia Press, J.G. Sandom, Techno-Thriller, Thriller. Bookmark the permalink.